Home » Blog » Inverter Generators VS Conventional Generators – What’s the Difference? What Is the Difference Between an Inverter Generator and a Conventional Generator? What Is Considered a Conventional Portable Generator? What Are the Key Differences Between an Inverter Generator and Conventional Portable Generator? Which is Better, an Inverter Generator or Conventional Portable Generator? Many types of generators are labeled portable generators but there are actually many differences in technical specifications, design and use between generator types. An inverter generator specifically is quite different from what many consider a conventional portable generator. Despite their key differences, inverter generators are often seen on ‘top portable generators’ and ‘best portable generators’ lists. This is because most inverter generators are easier to carry than larger high power portable generators. There are pros and cons for both types of generators. Which advantages outweigh which disadvantages depends on what the generator is going to be used for. Read on to recognize the difference between an inverter generator and a conventional portable generator. This helps you decide which type of generator is the better fit for your needs. When talking about a portable generator, people usually mean the fossil fuel-powered generators that are mobile. These are the most commonly purchased generators. A conventional portable generator is in its basic sense a fuel-powered engine with an alternator that has an electrical output. 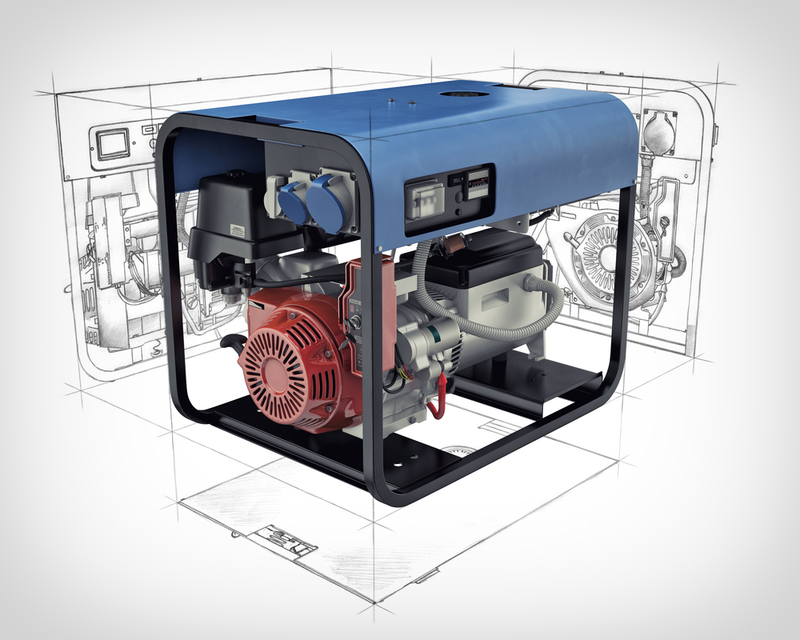 The three most common fuel types used for portable generators is gasoline, diesel and propane. Some portable generators are hybrids. This means that the engine can run on more than one type of fuel – usually a combination of gasoline and propane. The engine speed and the corresponding electrical output is the key characteristic of a conventional portable generator. A conventional fuel-powered portable generator is meant to run 3600 rpm to generate 120 volts and a frequency of 60 Hertz. However, one of the main disadvantages of most fuel-powered portable generators is that the machine cannot maintain a steady 3600 rpm. This means, that the voltage and Hertz also fluctuates. The fluctuations are referred to as harmonic distortion. The constant changes in electrical output or high harmonic distortion is why fuel-powered portable generators don’t provide what is called ‘clean electricity’. Clean energy is preferred for electrical devices that are sensitive like laptops, DSLR cameras, mobile phones etc. Not being able to hold steady at 3600 rpm is also the reason why fuel-powered portable generators are so noisy. With fuel-powered portable generators there is a correlation between its fuel tank, power and run time. In most cases, the bigger the fuel tank, the more power and the longer the run time. Since some portable generators can produce upwards of 10,000 watts of power, you can imagine that these are quite large and heavy generators. Despite their size and weight, most models are still portable – most conventional portable generator models have wheels and a handle. The mechanics of inverter generators are slightly more complicated than conventional portable generators. There are more parts involved in delivering the final electrical output. Many inverter generators also run on fossil fuels. In addition to the drawing power from the fuel tank, inverter generators also have a battery, alternator and inverter. The power from the engine is a high frequency AC current which is then converted into DC current by the alternator. That DC current is then converter back into AC current by the inverter. Like with conventional portable generators, inverter generators also have an output of 120 volts at 60 Hertz. However, because of the extra steps in the electricity production, the current of an inverter generator is much more stable. In other words, there is less harmonic distortion which is why inverter generators are said to produce ‘clean electricity’. The quality of electricity produced by inverter generators is comparable to the quality of electricity that you receive from the mains electrical supplier. The clean electricity is possible because of two factors. The first factor is that the initial AC current in an inverter generator is at a high frequency which gives more electrical energy. The second factor is the inversion of the DC current back into AC current. The mechanics of an inverter generator has more control over the AC frequency which lets it provide a very stable sine wave. The greater control over the electrical output makes inverter generators quite energy-efficient. It can adjust its voltage to what is exactly needed by the connected load while still maintaining an rpm of 3600. The stable current is also one of the main reasons why inverter generators are quite silent compared to conventional portable generators. Below is an overview of the main differences between conventional portable generators and inverter generators. Notice that there are mechanical differences and secondary differences that are a result of the mechanical differences. In other words, the difference in how a conventional fuel-powered portable generators runs and how an inverter generator runs gives different possibilities in design and use. Scroll further down to find out how these differences pose advantages and disadvantages for specific tasks. The main technical difference between inverter generators and conventional generators is what kind of electricity is produced. Conventional generators only produce AC electricity while an inverter generator produces electricity in 3 phases (high frequency AC to DC back to a stable AC current). The stable sine wave is what makes inverter generators so unique: it is considered a ‘clean electricity source’. This means that there is minimal harmonic distortion and so is a safer energy source for sensitive electronics like a mobile phone, tablet or laptop. In comparison, a conventional portable generator has a much more messy sine wave which causes more harmonic distortion. Though still a suitable power source for many electrical appliances, the more sensitive personal devices that have microprocessors can be damaged but this type of current. Conventional portable generators are able to produce more power than inverter generators. This has to do with a number of factors including the size of the fuel tank and the mechanical difference in electricity production. Inverter generators are more energy efficient thanks to how the final AC current is produced. The engine of an inverter generator automatically adjusts to the load which a conventional portable generator cannot do. The greater fuel efficiency of inverter generators allows for smaller fuel tanks. Greater energy efficiency means less fuel is need for similar run times and so the fuel tank can be smaller, as well. Conventional generators are not as fuel efficient so they tend to be bulkier because of the larger fuel tank. However, this larger fuel tank does allow for a larger power output. The difference in power is often the deciding factor between an inverter generator and conventional generator. Where inverter generators have an average power of 1200 watts to 4000 watts, conventional portable generators can reach over 10,000 watts. Inverter generators are generally more portable than conventional fuel-powered generators. This again has to do with the amount of power they produce. Conventional fuel-powered generators which produce more power have a large fuel tank and larger engine so more material is needed to house the machine. This is why conventional portable generators are bigger and heavier than inverter generators. To still be portable, the larger conventional generators tend to have wheels and handles for pulling. Still, this can be quite a task since many portable generators still weigh over 100 pounds. Inverter generators are smaller because their fuel tank is smaller and don’t need as big an engine since there is a lower power output. 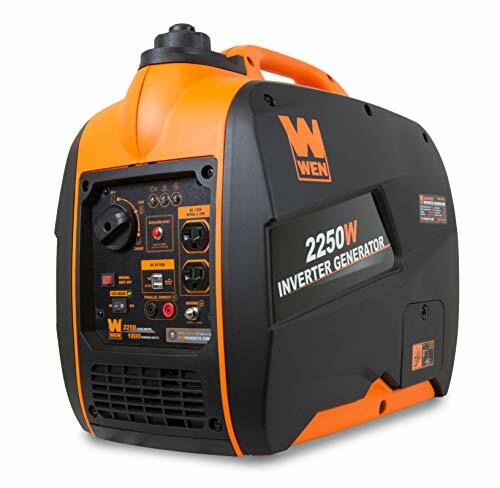 This cuts a lot of weight which is inverter generators are often light enough to be hand carried with a handle. Most inverter generators weigh less than 100 pounds. It is common for an inverter generator to only weigh around 40 – 60 pounds. Conventional portable generators are infamous for the noise that they make. This has to do with its mechanics so even with noise-minimizing efforts, conventional fuel-powered generators remain noisy. In comparison, the technology used by inverter generators makes them run quieter. Inverter generators run at a steady 3600 rpm which removes the bulk of the noise. How much noise a generator makes is usually mentioned in the product description. Most manufacturers will mention the amount of decibels the generator makes at either a half load or quarter load. Many inverter generators produce around 54 – 58 decibels of noise. This is far quieter than most conventional generators which tend to produce 64 decibels or more. Manufacturers try to make up for the lower power output of inverter generators by installing a parallel connection. With a parallel connection, two separate inverter generators (of the same model) can be connected to deliver double the amount of power. As of now, conventional portable generators don’t offer the parallel connection. Considering they are already more powerful and less portable, it is not a surprise. Each state has its own regulations on the accepted greenhouse gas emissions of generators. These regulations can be stricter when the portable generator is to be used inside national parks or nature reserves. In most cases, a portable generator must be at least EPA compliant. In the state of California the generator must also be CARB compliant. Inverter generators already produce less greenhouse emissions than conventional power-fueled generators. It is easier to find an inverter generator that meets the environmental requirements than to find a conventional portable generator that does. In general, conventional portable generators are cheaper to buy than inverter generators. Conventional portable generators are the most affordable option, especially when a lot of power is needed. The reason why inverter generators are more expensive is because they work on newer technology and have many extra benefits like being more quiet, greater fuel efficiency and producing an electrical current with minimal harmonic distortion. Regular portable generators are quite simple machines and have been available longer which is the main reason that the manufacturers can offer a lower price point. The advantages of inverter generators over conventional portable generators is that they are more quiet, are more compact and lightweight, more fuel efficient, are safe for sensitive electrical devices and are generally more environmentally friendly. The disadvantage of an inverter generator is that they usually are more expensive than a comparable conventional generator and don’t house as much power. Given these advantages and disadvantages, an inverter generator is more suitable for occasional use and specifically for outdoor activities like camping. An inverter generator is a good choice for when you don’t need a lot of power but do need convenient clean electricity that is easy to carry with you. The main advantage of a regular portable generator over an inverter generator is that it produces much more power. The disadvantages of a portable generator is that it is bulkier, heavier, makes much more noise and produces more greenhouse gas emissions. A regular portable generator is best used as a backup generator for the home in areas where there are frequent power outages or risks of natural events like blizzards that are likely to cut the mains electricity supply. The models with rough track wheels and a sturdy build are also more suitable on work sites. Whether an inverter generator or a conventional portable generator is better really depends on what the generator is to be used for. An inverter generator might be the better option for frequent campers or as a backup source of electricity during road trips while a conventional portable generator works better to power a home or a work site. Think about where you need the electricity and how much power you actually need. This is the best way to decide between the options.